LIQUID Metronics Inc (LMI), represented by Pryde Measurement , has released the new look AA Series chemical metering pump, replacing its predecessor, the A Series pump. Newly re-designed housing improves the drive's heat displacement maintaining long term electrical component integrity. 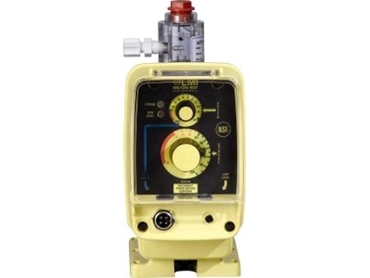 LMI's electronically pulsed metering pumps draw current only during the discharge stroke saving power. The modular construction of the AA Series means components and major assemblies are easily replaced. No soldering is required to replace any part of an LMI pump. The re-positioned electrical connector attachments on the front panel has made the drive more user friendly. The addition of a face shield protects the front panel from potential hazards and simply lifts for easy access. The corrosion proof glass fibre reinforced polypropylene housing also adds to keeping internal components safe. LMI's range of liquid end accessories has improved the functionality of fluid handling, eliminating problems associated with loss of prime, back pressure, pressure relief and high viscosity fluid delivery. Liquid end accessories are available in a range of materials providing chemical compatibility in many process applications.